There’s a new kid on the book recommendations block. We’ve all heard of Bookbub, Ereader News Today, and even Bookblast. They’re all sites that advertise book sales for authors. 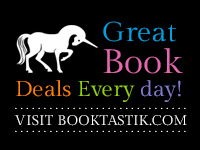 Booktastik does this and more. Subscribers sign up for free and can choose to receive not just ebook deals but info on new releases and author competitions and giveaways. As an author, how many times have you decided to run a promotion, but you only have Facebook to spread the word? Well now you have Booktastik to help. Booktastik also has vetted reviews on the site, so if you read a review, you know the reviewer has read the whole book and is giving a considered opinion. At the moment, all new sign-ups for the daily email will go in the draw to win a Kindle Fire. Oh, and I forgot to mention the weekly author interviews. There’s so much great content for readers and so many opportunities for authors. So click on the big unicorn and get over there and check it out! A writer I know is having an exciting Facebook event. If you’re looking for some new fantasy or paranormal books to read, check it out – you just might win! Thanks to Dionne for letting me hijack her site for a very special announcement. Are you one of the thousands of aspiring authors hoping to publish your book this year? Have I got the perfect book for you and it’s coming out January 13th — and it will be free that day too!